Ransomware worm that takes advantage of a vulnerability in the Windows operating system remains a threat. Please see the below PDF for a copy of an urgent security alert message from NYU CIO Len Peters. This message, relating to steps you should take to protect the data on Windows computers from the ransomware attack, was distributed to the entire NYU community via email on May 14 at 11:07pm ET. Should you have any questions or concerns about this message or the instructions it contains, please contact the NYU IT Service Desk, open 24×7: www.nyu.edu/it/servicedesk. You should take this opportunity to make sure that your Windows systems are patched and up to date, and if you have not restarted your computer recently, do so, to ensure that any applied patches take effect. For tips on how to create passphrases (strong passwords), and for information on password managers, use of 2 factor authentication and more, watch this 3 minute and 43 second video from SANS. This video will be available throughout the month of May. For information on NYU Multi-Factor Authentication, please click here. For more information on password managers and password best practices, please see the following NYU IT Connect article. Are your NYU Drive files correctly shared? 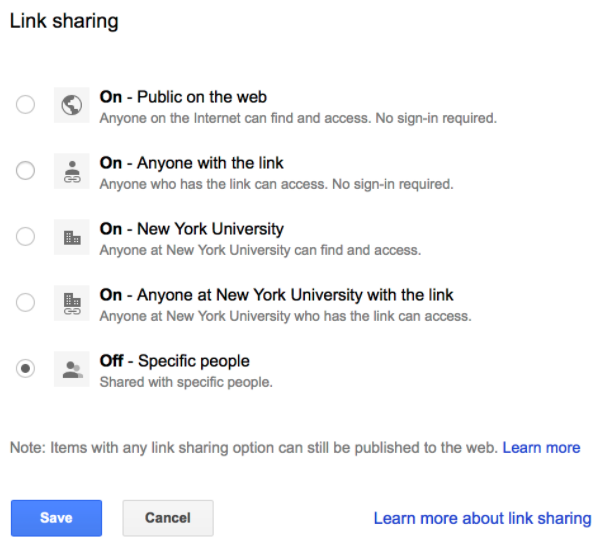 To confirm the share settings of existing NYU Drive files, use the Drive Eye add-on to locate any files shared within and outside the NYU community. The Drive Eye add-on will produce a report that allows you to click the links associated with listed documents and change the share settings. For instructions on how to install and use Drive Eye, see NYU Drive: Finding and securing shared files. Click File, Share, or the Share button at the top right corner of your screen. In the following dialog, click Advanced. Confirm that your file settings appear as follows. (Note: The “Private” option is enabled by default). You can choose another share setting via Change. 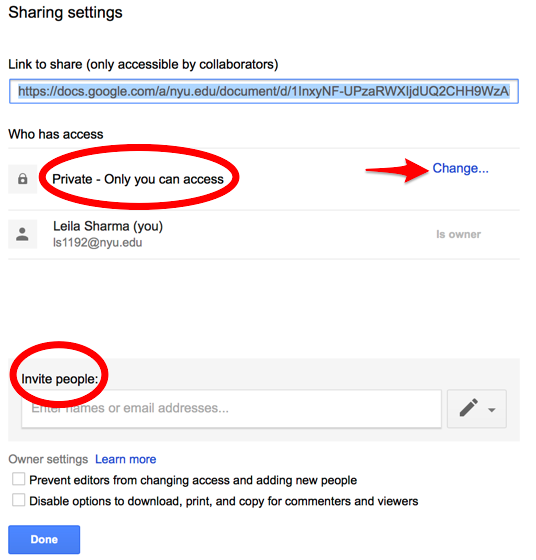 Invite people or Google groups via Invite People. Click Done to return to your document. For more information about NYU Drive support and training resources, please visit www.nyu.edu/it/drive.